Dealing with the pain of constant heartburn for years, Amy finally decided she’d had enough when the only food she could eat comfortably was baked chicken and water. Not being able to enjoy going out to eat for lunch or plan dinner parties, without taking a large daily regime of pills, she started to think there had to be another way to live. “Every day I thought I was going to die from my heartburn,” she recalled. Amy had seen several gastroenterologists to try to find other options rather than the multiple pills, both over the counter and prescription, which she was taking to find relief from her heartburn and acid reflux. Every gastroenterologist she visited had a similar treatment plan – more medications, better medications, newer medications, none of which suited Amy and the treatment plan she wanted. This frustration caused Amy to take matters into her own hands. Doing her own research, she found that there were surgical options to control her symptoms and came across an innovative procedure called the LINX Reflux Management System. After learning that the LINX was highly recommended by patients who’d had the procedure, and of its high success rate, she decided to look into the Heartburn Treatment Center. The Heartburn Treatment Center was one of the first exclusive centers that offered this cutting edge technology. Wanting to learn more, Amy called the Heartburn Treatment Center to set up an appointment as soon as possible. “When I found the Heartburn Treatment Center, I actually felt somebody cared about me and understood what I was going through,” she said about the day she visited with the heartburn surgeon. 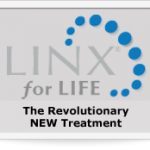 “Of all the options I was offered, LINX made the most sense.” After Amy underwent a few clinical tests ordered by her surgeon, she quickly found out that she was a candidate for the Linx procedure. Elated by this, she booked the soonest appointment for the minimally invasive procedure and knew she was soon to be on her way to a life of less medications and pain. The day of her procedure, Amy was out of the operating room within thirty minutes, and by the next day, she was back at home with no diet nor activity restrictions. “I drove three hours to have it done and I’m so glad I did,” she said about the long drive to the hospital that she was more than willing to make. Amy soon found out that her relief and time was more than worth the extra miles. At home, she tentatively began eating foods that she hadn’t been able to enjoy in years, foods other than just plain baked chicken and water, and was shocked at what she experienced. Amy could not believe that she could now eat different foods without grabbing her heartburn medications soon after consuming them. “I want everyone to have a LINX if they have heartburn,” Amy mused, illustrating how much happier she instantly was after returning home from her procedure.